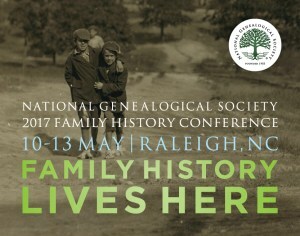 Thank you for attending the NGS 2017 Family History Conference in Raleigh, North Carolina. We were delighted to see you and hoped you enjoyed the conference as much as we did. In all, 2,450 people participated in the conference. We hope the conference enhanced your research and analytical skills and provided you with more technological tools. Most important, we hope the knowledge that you gained will help you as you advance your research, analysis, and writing. You can still sign up for the on-demand presentations of the ten lectures recorded via live streaming from http://www.PlaybackNGS.com. If you are interested or if you have a friend who missed the conference, the on-demand recordings will be available for viewing through 13 August 2017. The package includes a full downloadable version of the syllabus. The details and costs for the recordings are available at http://www.playbackngs.com/2017-raleigh-ngs-live-streaming-plus-3-months-access. Audio recordings of more than 150 lectures are also available. See http://www.playbackngs.com/7770-r for titles and prices. A number of awards were presented at the conference. Details about the 2017 awards and the recipients can be found at http://www.ngsgenealogy.org/cs/pressroom/press_releases. We encourage you or your society to enter the 2018 competitions and awards. Details about the awards and submission deadlines can be found at http://www.ngsgenealogy.org/cs/awards_competitions. We look forward to seeing you next year at the NGS 2018 Family History Conference in Grand Rapids, Michigan, 2–5 May. Details will be available in the coming months on the NGS Family History Conference website.